Ever wondered what writing system, alphabet and sounds your Irish Gaelic speaking ancestors used ? The Irish alphabet has only 18 letters with no k, j, x, y or z for example. Other letters approximate these sounds. 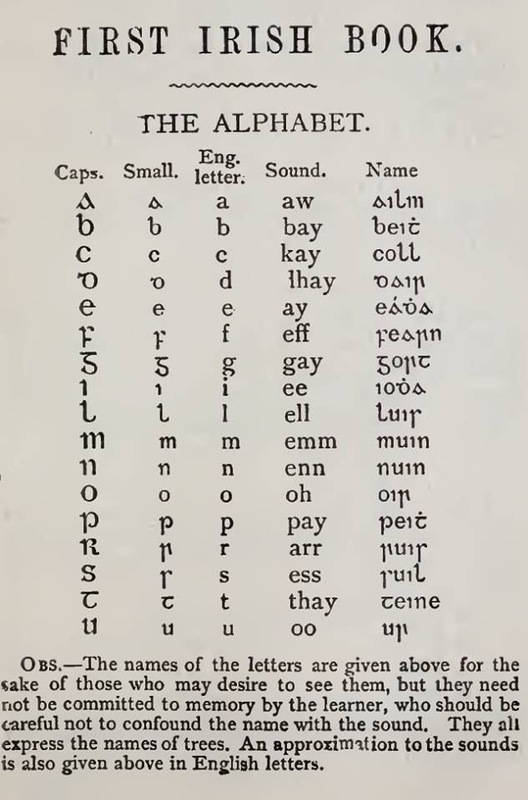 In earlier written forms of Irish Gaelic, dots and other diacritics were used to elongate sounds or to add lenition. This list contains an interesting explanation, and gives approximate English lettering and sounds. Interestingly, the names of Irish Gaelic letters (not to be confused with the sounds they make) are all named after spieces of trees found on the island. Find out more about your Power family’s history at this summers Power Clan Gathering in August. The error in the booking facility has now been fixed (hopefully) … please feel free to book again and let me know if any issues still persist. Booking and payment for the Power Clan Gathering 2016 is now available on this website. See the PAYMENTS page here for details or see the BOOK NOW link in the top navigation. Folks – here finally (and apologies for the delay) is our Programme of Events for the 2016 Gathering, August 27th-30th 2016. Programme available for download here. Please feel free to share it with your friends and family, who may be thinking of joining us. Patrons not already joining the Ireland-Newfoundland Festival of the Sea should aim to arrive in Ireland on either Friday 26th or early Saturday 27th August. – ‘Meet & Greet’ session in a Waterford City hotel, with refreshments. – Walk the Anne Valley Trail to Dunhill Castle, ancestral home of the Powers. – Short talk on the history of the Castle, followed by coffee and chat in Harney’s pub, Dunhill. – Travel to Dungarvan, Co. Waterford & take lunch and a stroll at your leisure. – WWI Memorial Ceremony, at Dungarvan Memorial Wall, remembering the Powers who fell in the Great War, followed by chat and refreshments. – Short tour of Dungarvan Castle, an Anglo-Norman fortification founded in 1185. – Return to Waterford City for dinner and music in a local hotel. – Tour of Curraghmore House & Gardens, historic home of the de la Poers. – Catered picnic lunch in the grounds of Curraghmore, including local food/produce showcase event. – Return to Waterford city for dinner in a local hotel. – Evening concert in Christchurch Cathedral, Waterford, with local musicians and storytelling from a seanachaí. – Tour of the famous Waterford Crystal showrooms and manufacturing facility. – Lunch at leisure and free time for shopping in Waterford city centre. – Guided tours of both Reginald’s Tower or the new Medieval Museum and undercroft. – Gala closing event at Medieval Museum Undercroft with food, music and Sláinte show. Entry to all tours including Curraghmore, Reginald’s Tower, Dungarvan Castle, Waterford Crystal and Medieval Museum. 4 evening meals, 1 lunch and 3 refreshments. Price per person : EUR€ 350, CAD$ 530, US$ 380, GBP£ 255. A payment facility will be made available on this website in the coming weeks. Payment doesn’t have to be immediate but reserving your place by email is important! Calling all Powers around the World ! The dates for the 2016 Power Clan Gathering have been confirmed as Saturday 27th to Tuesday 30th August. Work is almost complete on a provisional Program of Events and this will be made available shortly. Event packages will be available for purchase on this site. The Gathering will be based in Waterford City with days also based in Dunhill/Curraghmore and West County Waterford. We appreciate your patience in the meantime, and if we can be of any assistance, please email your query to conanjpower@gmail.com or fill out the form below. Here at the Power Clan Gathering, we’ve taken a step into family history and have started an exciting new project called “Irish Emigrant Trails“. Our aim is to assist those of you who are planning a trip to Ireland with your family history, and then, based on the results, develop a trail for you to follow when you get here – either with us as a guide or by yourselves. By tailoring the trail around the research we do before you arrive, visitors can get right down to it – we aim to find homesteads, grave sites, parishes, villages/towns etc. where possible, all while seeing the wonderful sights Ireland has to offer. We’d be delighted to hear your feedback on this new project and if we can be of any assistance to anyone planning their next trip (or maybe the first ? ), please contact us over at Irish Emigrant Trails … or via Facebook. Thinking of joining us for the Power Clan Gathering ? Here are some of the offers right now from the various airlines that’ll help you get here. All prices are subject to availability and are current as of today, May 14th. We want to know your Power Clan nicknames and the stories behind why each branch of the clan was know as such. There were so many Power families in Waterford and surrounding areas that they had to be differentiated by nicknames … and we’re sure there are some funny or unusual ones about. For example, one of our committee member’s family is known as”The Mountain Powers” to distinguish them from the Power families who lived at the bottom of the mountain – “The Jeffs” ! So please leave your stories and nicknames in the comments and we’ll give 2 tickets to our Gardenmorris BBQ and Ceilí event on June 2nd to the winner ! For those members of the far-flung Power Clan who cannot make it to Waterford this May31-June4, we are offering the planting of memorial trees a small token of remembrance of those in our families that have passed on. For €10 (which is about $13 US & Canadian, $12 Aussie and £8 pounds) you can have a spruce sapling planted in the grounds of Dunhill Castle during the opening ceremonies of the Power Clan Gathering on May 31st. This also includes a dedication tag, which will be laminated and attached to the tree, a blessing by Fr. Paul Murphy of Dunhill, who will officiate at the ceremonies, and a photo of the tree/planting. Trees can be ordered via our website. Per Day & Per Event tickets now available ! Per Day & Per Event tickets are now available to all or any of our events at the upcoming Power Clan Gathering 2013. Everyone is welcome at ALL our events but booking is essential – bookings and payment can be made from this page.